Rejuvenating & moisturizing, more potent & effective than the fresh aloe plant itself. Use Herbal Aloe Force® Skin Gel on the skin to relieve burns, stimulate tissue repair, and to keep skin looking clean, clear, smooth, toned, hydrated, and glowing with health. 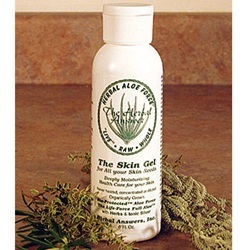 Herbal Aloe Force® Skin Gel contains more than 200 vitamins, minerals, amino acids, and colloidal silver. Aloe is known as the "burn plant." Its anti-inflammatory, pain and itch relief, soothing, tissue-regenerating, and healing properties make this gel the perfect 'salve" for all types of burns (including any itching and burning from radiation treatment). Herbal AloeForce Skin Gel has less than 1/10th of one percent methyl paraben added to it, as an inhibitor of fungus, yeast, mold, and other micro-organisms. Because the product is made of raw aloe, the methyl paraben keeps micro-organisms from growing in the product once it is opened. Methyl paraben has been used for almost a century to keep cosmetic (topical) products clean from micro-organism growth. Recently, researchers found ester parabens in breast tissue during a study on breast cancer—but they did not find methyl parabens. Methyl paraben is not the same as ester paraben. At our customers’ request, we are in the process of finding a replacement for methyl paraben in the Herbal AloeForce Skin Gel. Use for face, hands, feet, body, joints, muscles, scalp, hair, mouth, gums, and sensitive areas.